Film Forum Under Construction 2018: a book of photographs by noted New York City photographer Jan Staller, is a compilation of images made during the recent expansion and renovation of the cinema. Staller's interpretive vision transforms the quotidian materials of construction (concrete and wood, wire and plastic tubing, plaster and metal) into a surprising and wondrous fantasy of color and texture. 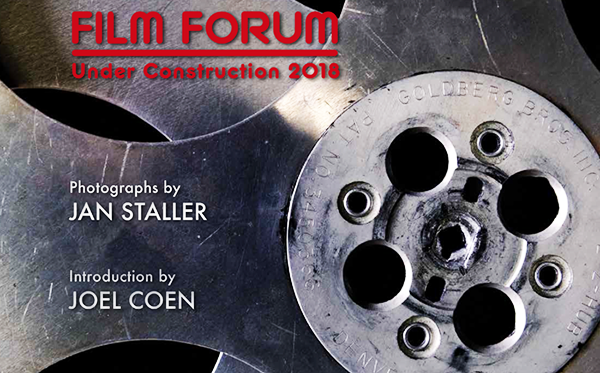 Film Forum Under Construction 2018: a 500 piece edition, is comprised of 45 color plates, with an introduction by Joel Coen, co-writer and director, most recently of THE BALLAD OF BUSTER SCRUGGS. Preface to the book is by Film Forum Director, Karen Cooper.